Somewhere between the pit of man’s fears and the summit of his knowledge. 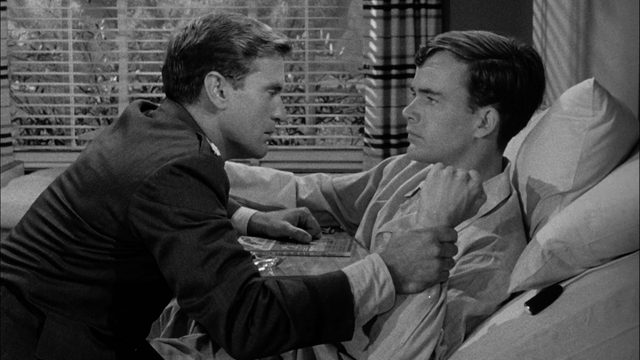 Before The X-Files, Star Trek, and even Doctor Who, Rod Serling’s The Twilight Zone introduced science fiction and the supernatural to the American living room. Drawing upon modern concerns of technology, society, and politics, as well as a long tradition of horror, science fiction, and fantasy literature, the show must have been radical indeed for a nation accustomed to I Love Lucy and Leave It to Beaver. 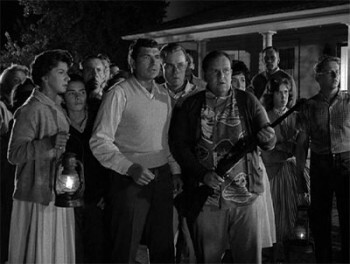 The Twilight Zone ran from 1959-1964, and more than 50 years later the series has survived as a prime part of pop culture. Yes, the dialogue occasionally grates the modern ear, and the production values sometimes appear shoddy by today’s standards. But the episodes I have chosen here represent impressive work by any standard. Believe you me, there are more great episodes than I could fit on this list—I had to pick the ones that riveted from start to finish, and asked the most haunting questions. I’ve tried to avoid major spoilers (especially the twists! ), but be prepared for some minor plot reveals. Here we go! Killer twist in this space-exploration adventure, in which Serling’s trademark cynicism rears its snickering head. Over-worked, under-loved shlub finds an escape…through unexpected, ghastly means. 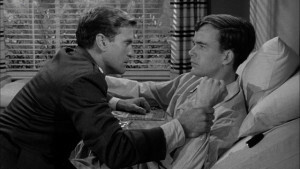 Echoing It’s a Wonderful Life, Serling tells the tale of a suicidal trumpet player who gains a new lease on life. Pedantic for sure, but the story of a society that has abolished any trace of human passion has a darkly appropriate conclusion. William Shatner is cursed with seeing things no one else does, resulting in a suspenseful battle with a gremlin…and his own sanity. 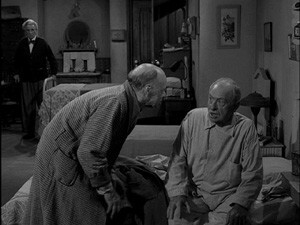 Though I have it at the number 10 spot, few episodes of The Twilight Zone have reached this level of existential horror. After a brief loss of contact with mission control, three astronauts survive a crash landing on Earth. It’s not long before they begin to disappear…as if they never existed. 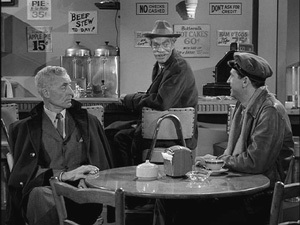 You get a real sense of loneliness and despair from this episode, as when Lt. Col. Forbes returns to the bar where he had just seen his friend Col. Harrington, pleading desperately for him to reappear. And an extra twist to the narrative asks some terrifying questions about the cosmic bureaucracy that seems to be orchestrating the entire event. This infamous story of botched plastic surgery has a thorough understanding of its title…and then some. A heavily bandaged Janet Tyler has just had her final legally-allowed treatment to appear normal, but fears it won’t be enough. And as we listen to the nurses and orderlies, it seems her fears are entirely justified. Like a film noir, the hospital is draped in elegant shadows, reflecting Janet’s fearful mental state. We build up brilliantly to the reveal of Janet’s surgery—still shocking in its appearance after all these years. 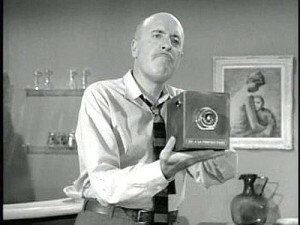 The petty criminals in “Camera” may have served as prime influences for the Coen Brothers, for all their cockiness and sheer stupidity. After stealing a device that takes pictures of the future, the crooks use it to win big at the races. But they fail to take their selfishness into account, resulting in some darkly comic slapstick situations. Featuring Serling at his most cynically funny, the episode takes a fairly creepy premise and turns it into romping farce. 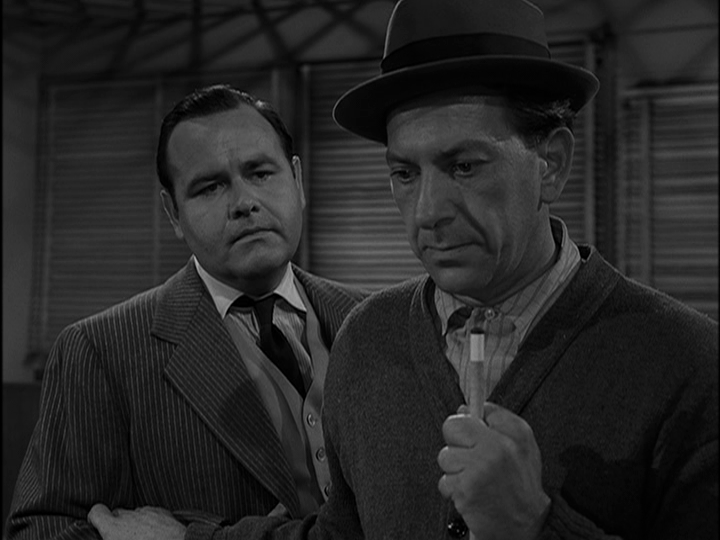 Serling was deathly afraid of repressed hostility, as this episode about mysterious electrical outages illustrates. When power disappears from the generically named “Maple Street,” citizens find themselves overcome with paranoia about their neighbors. A web of old prejudices and molehill-sized mountains, “Monsters” shows us the aggressions hiding under the surface of small-town America, waiting for a chance to emerge. Franklin Roosevelt’s adage about fear comes to mind when we finally reveal the source of the power outages. Humanity is at its most primal in this episode in which an elderly woman is terrorized by small aliens from a planet unknown. While homely, the woman’s rustic dwelling soon becomes a gallery of horrors. 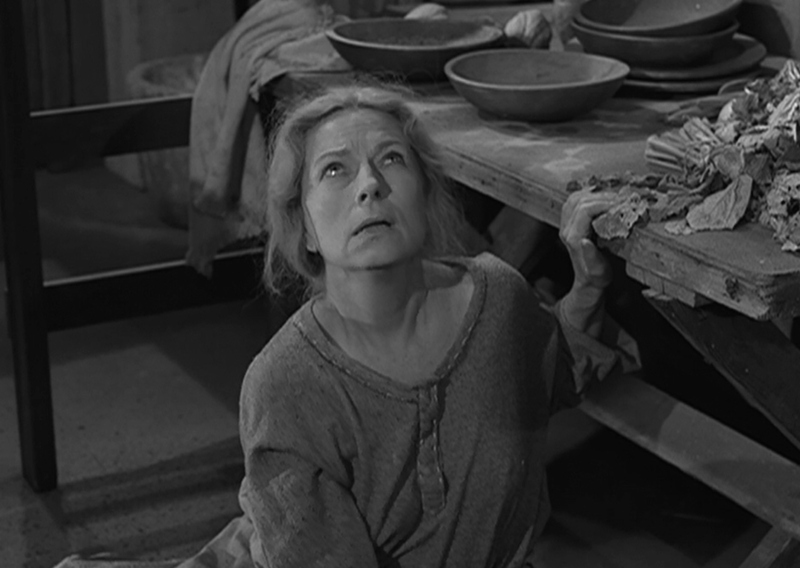 Starring Agnes Moorehead in a role that would test any actor to their limits, the episode largely plays out like a silent film while also making use of unearthly screams and grunts. Moorehead is a force of nature as she fends off the miniature intruders and deals some damage of her own. And while the twist at the end is classic, it only adds to the episode’s raw, animal immedicacy. Drawing upon nuclear paranoia of the time, this episode fulfills the adage of “careful what you wish for” in a turn of poetic justice. 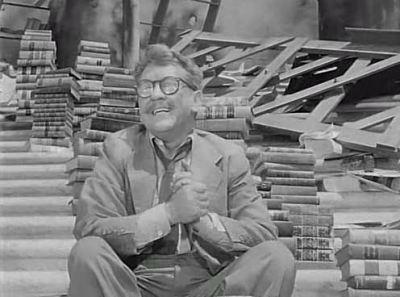 Burgess Meredith plays the put-upon Henry Bemis, cursed with a love of literature but no free time to satisfy it. Here the apocalypse becomes salvation for our mousy protagonist…or so it seems. The last-minute twist makes us rethink our allegiance to Bemis and his bibliophilia. It’s tragic and tragically funny. Dismissing conventional terror, this episode details the horrors of aging and loneliness. In a senior retirement home, Charles has convinced his old friend that playing a childhood game will revert them to children once more—if only they believe. What starts as a riff on prison-escape stories becomes something more supernatural and eerily sad. George Clayton Johnson’s fable is a more modern reworking of the Pied Piper tale. The sound of children’s laughter haunts us even as it calls out for us to join. Here’s an episode that rewards repeat viewings, once you realize the motivations behind the seemingly beneficent alien race. 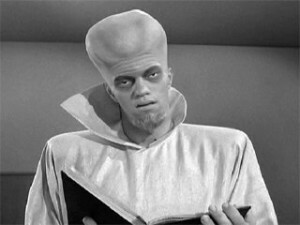 Bestowing humanity with a panacea for all the world’s problems, the Kanamit aliens are imposing in appearance but nothing but magnanimous to their Earthly hosts. Yet something feels off through the entire episode, thanks to some decidedly vague dialogue from the alien race. The answer to those fears continues to mine the dark humor that marked the best moments of the show. The only thing protagonist Mark Chambers can do at the end is resign himself to his fate, and perhaps laugh a little. It’s another alien thriller, but this one consists largely of chamber drama, where the wrong conclusions could lead to lethal consequences. A Martian has crash-landed and hidden himself among an unsuspecting group of bus passengers, and two policemen are tasked with weeding out the extraterrestrial visitor. Soon the fingers are pointing as prejudices and misconceptions are revealed. Director Montgomery Pittman shows some of the same finesse with claustrophobic spaces that made Sidney Lumet’s 12 Angry Men so effective. And even when it appears the mystery has been solved, Serling yanks the rug out from under us with a shocking (yet fitting) reveal. Want to talk about stakes? How about putting your skills to the test by putting your life on the line? That’s exactly what pool shark Jesse Cardiff does when he challenges the long-dead “Fats” Brown to see who truly is the “greatest of all time.” The episode benefits from perhaps the finest display of acting in the history of the series—Jack Klugman’s intensity as Cardiff threatens to leap off-screen, while Jonathan Winters makes the jovial “Fats” wise from his life of mistakes. You see the loneliness that comes from the pursuit of greatness, reflected in the ghost town of a pool hall. On top of exploring the characters’s dreams and obsessions, Buzz Kulik knows exactly how to direct a tense game of pool. Each pool ball sunk has menacing import. There’s a somber mood that lingers, but not without a hint of levity. Well, there we are folks! I hope you enjoyed my list, and please feel free to leave comments about your own favorite episodes. Absolutely my favorite show ever, glad you took time to make this list! I appreciate the love for The Invaders, it seems that one is often overlooked. Favorite episode not mentioned: Living Doll. Possibly my favorite, and definitely the one that scared me the most!